Avenue Advanced Skin Care chooses to use DermaPen® skin needling technology to provide exceptional results in skin rejuvenation. Considered to be the gold standard in skin needling technology, the DermaPen® uses oscillating medical-grade micro-needles to gently glide over the skin and encourage collagen growth, which is the key to skin repair. Skin Needling (also known as Collagen Induction Therapy – CIT) is a treatment designed to improve skin texture, smooth wrinkles, fine lines and soften scars and stretch marks. It is suitable for all skin types and all areas of the face, neck, décolletage and body. Skin Needling is a minimally invasive treatment that uses tiny needles to create micro-injuries to the skin. These micro-injuries induce a natural wound healing response of the skin, which creates a release of growth factors to the area and furthermore the depositing of new collagen and elastin. Inspired by acupuncture, skin needling uses special skin rollers containing hundreds of fine surgical steel needles, which are applied to the skin’s upper dermis, encouraging the body’s natural production of collagen and elastin. The aim is smoother skin and the reduction of scars and stretch marks. Skin needling has evolved considerably since first being developed in the late 1990s and skin care clinics now employ a variety of different instruments and different needle shapes and sizes when performing needling on patients. 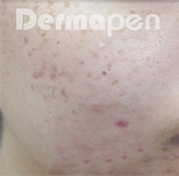 Acne scaring and enlarged pores before and after 5 treatments. Results may vary from patient to patient. Acne scarring before and after 5 sessions. Results may vary from patient to patient. Unlike other dermal rollers, the DermaPen® is a pen-like device that uses disposable surgical-grade needle cartridges for precise and sterile contact with the skin. The microneedles are adjustable, ranging from 0.25mm to 2.5mm in length. This allows your Dermal Clinician to tailor your treatment plan and target your epidermis at specific depths. This highly-controlled needling process causes microscopic wounds to prompt the skin’s natural healing process, which increases fibroblast activity and encourages the production of new collagen. We recommend a course of DermaPen® treatments to deliver long-lasting results. A consultation and VISIA skin analysis will determine the best course of action and the number of treatments you require. The pen-like device works by creating tiny punctures into the surface of the skin, which triggers the skin’s natural ability to heal and repair itself. The DermaPen® is agile and gentle enough to be used on the face, including the more delicate areas underneath the eyes and above the lips. Our vast experience, meticulous training, and clinically-proven techniques make us the leading clinic for skin needling across Melbourne. Is DermaPen® Skin Needling painful? For Skin Needling treatments greater than 1.0mm deep, a topical anaesthetic is applied prior to the treatment to minimise discomfort; all that is felt is a mild vibrating sensation with light pressure. Unlike other methods of needling, such as rollers, the oscillating needle pen technology distracts nerve receptors allowing for a relatively comfortable and fast treatment. Immediately after your treatment you will experience mild redness and heat for up to 24 hours. It is also normal to experience petechiae, or small blood blisters, which usually disappear 1-2 days post treatment. You may also experience some minor itching and flaking for 3-4 days post treatment. You will begin to see results approximately eight weeks after your first treatment. You will see positive signs of rejuvenation immediately after your treatment as well, due to the lifting and tightening of the skin that occurs due to collagen shrinkage. This will last approximately one week, and will then be replaced by the longer-term collagen tightening that takes place when your skin conducts its own wound healing process. At this point, your treated areas will experience sustained improvement for up to three to six months after treatment. Typically, six treatments are recommended, and are usually spaced approximately one week apart for best results. Your Dermal Clinician will discuss your treatment goals and personal situation to determine the optimal number of treatments you will need and the appointment spacing you require. 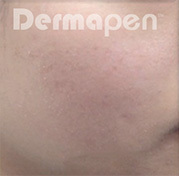 What makes your DermaPen® Skin Needling superior? At Avenue Advanced Skin Care, we follow the most up-to-date needling protocols from Environ, a leading skin care company that performs clinical trials to determine industry best practice. Our clients are able to achieve incredible long-term results thanks to a combination of specifically designed at-home cosmeceutical routines and in-clinic procedures. To find out more about our DermaPen® Skin Needling packages, please speak to one of our Dermal Clinicians on (03) 9521 5533.